style=”font-weight: 400;”>Have a Safe & Happy New Year! style=”font-weight: 400;”>Thank you to each of our readers (and watchers) that have tuned in each week for our online marketing news round up. We hope you all have a great new year and we can’t wait to see you again in 2017! rel=”nofollow” href=”http://www.toprankblog.com”>Online Marketing Blog – TopRank®. style=”font-weight: 400;”>In the past, the SEO battle was focused on either black hat, or white hat tactics. Black hat SEO was considered extremely aggressive and didn’t typically play by the rules of search engines. White hat SEO tactics on the other hand were typically closely aligned with search engine guidelines. style=”font-weight: 400;”>Today’s world of SEO looks much different (and it’s about time). Instead of hyper focusing only on keywords or search engine needs, smart marketers are concentrating first and foremost on the needs of users. User experience as it relates to mobile accessibility, content structure and user intent on search engines have become the new norm. style=”font-weight: 400;”> that always follow SEO best practices. style=”font-weight: 400;”>But what does the future of SEO hold, is there more? 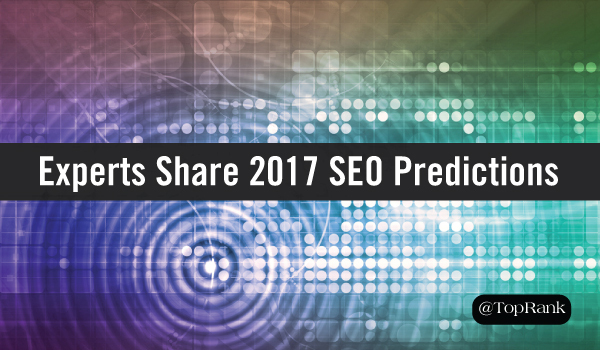 We tapped into the minds of some great marketers to provide their predictions of what SEO will look like in 2017.
style=”font-weight: 400;”>1) Create stand-out content, completely relevant and highly useful to their target audience. style=”font-weight: 400;”>2) Successfully promote that content to drive consistent engagement in the form of links, social shares, news, and other buzz. style=”font-weight: 400;”>We’re already seeing RankBrain begin to ‘take over’ and factor in more user intent signals than ever before. I think that will continue to happen and increase in 2017 (specifically, time on site, bounce rates, etc.). I think CTR from SERPs will be a bigger factor in re-ranking URLs as people develop more affinity for the brands they like and click on them when they see them; regardless if they are in pos. #1 or #9.
style=”font-weight: 400;”>I think links will still be important. I don’t care what article you read that says they are dying, they aren’t. I think social sentiment around brands, hashtags, keyword association (neighbors) across the web will help sort results. style=”font-weight: 400;”>If social platforms ever work together with Google, I could see platform specific searches influence rank on Google too. style=”font-weight: 400;”>The most significant change for SEO in 2017 will be the importance of the mobile-first index for Google. Many sites are ready for a mobile-first index but unfortunately many others are not. Google is continuing its focus on mobile, and it has been increasingly important to optimize for mobile users. SEO experts need to focus on the mobile user moving forward in 2017 in terms of metadata and user experience. 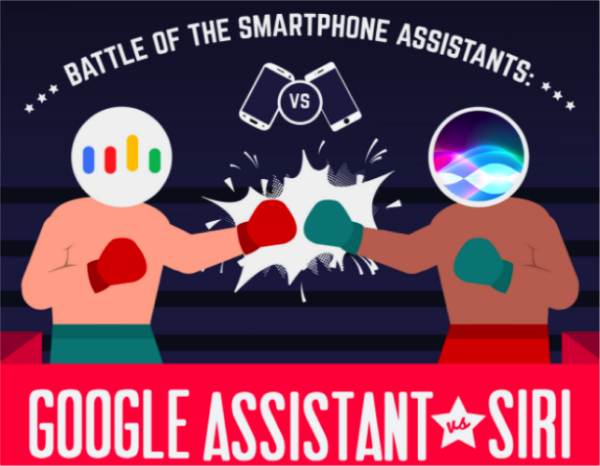 style=”font-weight: 400;”>With the rise of Google RankBrain, AI and machine learning are becoming incredibly important to think about for marketers and SEOs who want to capture valuable search visibility and be found at key moments of the customer journey. style=”font-weight: 400;”>What do these types of algorithms reward? Engagement – how many searchers click on your result and how long they stick around on your website. While these aren’t the only signals Google looks at to determine the quality of its search results (and where your site should rank for specific queries), it is definitely important. style=”font-weight: 400;”>In 2017, pay attention to how much engagement your brand or business is generating. Specifically: organic search CTR and time on site. style=”font-weight: 400;”>Even if improving your organic CTR and time-on-site doesn’t directly impact your rankings, it will still bring in more traffic that sticks around longer (and is more likely to convert). Write great titles that make searchers click – and reward searchers for their click by providing awesome, relevant content to match. style=”font-weight: 400;”>Each of these experts shared great advice about different tactics that they predict will rule 2017. You’ll notice that the core message behind each of these predictions is the same: put people first. style=”font-weight: 400;”>By focusing on creating a great user experience and understanding what it is that your users want, you’ll start 2017 off on the right foot! style=”font-weight: 400;”>Disclosure: Dell is a TopRank Marketing client. style=”font-weight: 400;”>Social media platforms enable people from around the world looking to connect and build personal and professional relationships. Earlier this year studies found that there are currently over 2 billion active social media users. 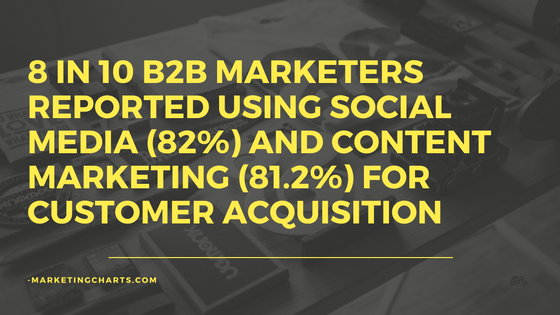 style=”font-weight: 400;”>If you consider the sheer number of people interacting on social networks, it seems like a no-brainer that both B2C and B2B brands should be spending time engaging with their audience, where they’re spending time. But finding a way to not only reach, but connect with audiences on social networks has become increasingly difficult. style=”font-weight: 400;”>To help ease the pain, we went straight to the source and tapped into the brilliant minds of marketers from brands like LinkedIn, Social Media Examiner, Social Media Today, BMC and our own team at TopRank Marketing to gain insights into their social media marketing predictions for 2017.
style=”font-weight: 400;”>Algorithms, bots, artificial intelligence and people working for very big companies will destroy the business models of people who produce content by disrupting the free flow of information. style=”font-weight: 400;”>Before the Internet, the power brokers of information were a few media companies that controlled the newspapers, magazines, radio stations and television. The Internet busted through those barriers and allowed anyone to produce anything for any audience. Information flowed and content mediums like blogs and podcasts flourished. style=”font-weight: 400;”>The Internet was the great system of disintermediation, eliminating the middleman and allowing a free flow of information. style=”font-weight: 400;”>Facebook will decide what you see. Google will serve up only that content that complies with its rules and are housed on its servers. Email solutions like Gmail and Yahoo will tighten their own algorithms so even reaching the inbox is at risk. style=”font-weight: 400;”>The information distribution highway will have toll stations that must be paid for by the those who create content. style=”font-weight: 400;”>If you want your content seen, you’ll need to house it inside the companies that control the toll stations. Google, Facebook, LinkedIn and more will incentivize content creators to not link to off-site content. These large businesses will become the equivalent of the 1990s America Online–a type of “Hotel California,” where you can enter but never leave. style=”font-weight: 400;”>Traffic to websites will decline and blogs will shut down. Gone will be the days of information flow and true information freedom. The future will only be more controlled, more filtered and less open. style=”font-weight: 400;”>But, born from this filtered, computer curated world, will come something new. Some young person in a spare bedroom will invent the next big idea that frees information once again. The pendulum will start swinging back and content creators will experience a new creative renaissance. style=”font-weight: 400;”>Are you ready for the change? style=”font-weight: 400;”>The biggest challenge marketers will face in 2017 is the same that they seemingly face year over year which is keeping up with the innovation around emerging marketing channels and technologies, such as Snapchat, Facebook Live, and AR/VR, while still maintaining an active presence on the traditional platforms used by the masses (i.e. print, social, digital, etc.). Undoubtedly, live video content will continue to take over newsfeeds with Facebook flexing its muscle as the go-to platform for marketers meanwhile Snapchat, and its looming IPO, will result in Snapchat attracting more brands as advertisers to their platform. style=”font-weight: 400;”> for their audiences. style=”font-weight: 400;”>Think about it. Social media platforms are constantly tweaking their formats and algorithms to provide users with the best possible content and experience, making it more difficult for brands and marketers to get organic visibility. Plus, nearly every brand is on social media, competing for the top spots. But what if your pages were able to offer such an awesome, relevant experience that would entice people to navigate on their own to see what the latest discussion, video or tip was? style=”font-weight: 400;”>, not just traditional social media marketing. From native video and long-form content to actively encouraging and participating in discussions, you need to ask yourself why anyone would visit your pages in the first place. Do you have a niche expertise or offering? Do you provide great entertainment? What is it that could set you apart? How can your social content connect? Then combine all that with data and insights to begin building a strategy to get people there, participating and coming back. style=”font-weight: 400;”>From Brexit to the American election, 2016 has been an eye-opening year and a divisive one for many around the globe. A chasm has come to the surface in a way that really no one can deny. It’s a divided world. As a result, my prediction (and personal hope) for 2017 is that social media and content marketers are going to strive to become even more empathetic in their content topics. I hope we’re also going to be committed to creating content that is humanizing with the innate ability to understand and share the feelings of others. style=”font-weight: 400;”>On the second, social ROI has long been the thing that critics fall back on, that you can’t connect a ‘Like’ to a cash money result. But you can, and more and more systems and processes are being developed for just that. Facebook, for example, has been evolving its Conversion Lift metrics which correlate online ads and offline sales, incorporating data from the businesses POS system. With the evolution of beacons, geofencing and other tracking technologies, it’s going to become easier for more businesses to directly link their on and offline efforts, enabling them to outline definitive ROI trails. style=”font-weight: 400;”>Phew! If we take a look at just the last few months, there have been tremendous advances made in social technology, and the way that users interact with social networks. Imagine what all of 2017 will hold! style=”font-weight: 400;”>Creating an impact on social comes down to a few very simple ideas which include finding ways to uncover how your social audience interacts (and do that) and developing a destination that they will want to come back to again and again (like blogs have traditionally done) so that you don’t have to rely only on advertising to drive eyeballs to your content. style=”font-weight: 400;”>Disclosure: LinkedIn is a TopRank Marketing client. Instagram Is Facebook’s Biggest App Advertiser. Twitter Is Banned. I’ll be back next week with my lovely co-pilot, Josh Nite, to bring you more online marketing news. Have something newsy to share? Tweet it to @toprank or leave it in the comments! 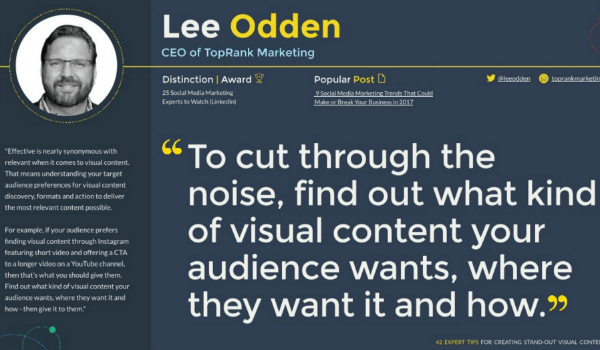 The post Online Marketing News: Content Deluge, Spotify Data Stories and Cyber Monday Breaks Records appeared first on Online Marketing Blog – TopRank®. For many marketers, the holiday season is one of their busiest times of year. 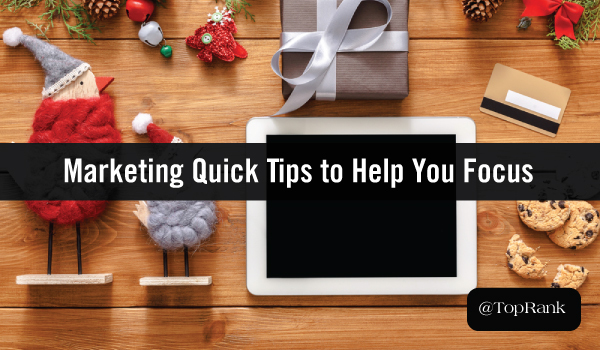 But let’s face it, focusing on solving your top marketing problems when you have a holiday party to go to and a new year just around the corner isn’t always easy. This year, let’s change our perspective. Instead of letting things slip with the notion that you’ll pick back up in the new year, finish 2016 with a bang! This post has a little bit of everything to keep you motivated and ranges from social media marketing, to email marketing and SEO. Pick the top one or two items that you’re struggling with most this time of year and commit yourself to maintaining a laser focus through the end of the year. Need to Inspire Engagement with Social Media Marketing? Listen and empathize – Learn the current situation, goals and troubles involved as well as the ability to empathize with both the brand marketer and the customers they’re trying to reach. Social Media program Audit – Inventory your assets and examine current social performance. This will help you determine where to focus efforts, and what to let go. Community building and distribution of content – It’s more than pushing brand content, it’s making active efforts to attract and engage a community. Improve Social User Experience – SUX – Make it easy for users to find your brand social channels from your company website. Include social sharing widgets on your blog to make it easy for readers to share on their favorite social network. Social Media Advertising Just Not Hitting the Mark? Find the right platform – One message does not fit all social media platforms. Tailor messaging – Always create content that speaks directly to your audience. Messaging for a CEO should be different from that for a Manager or Consultant. 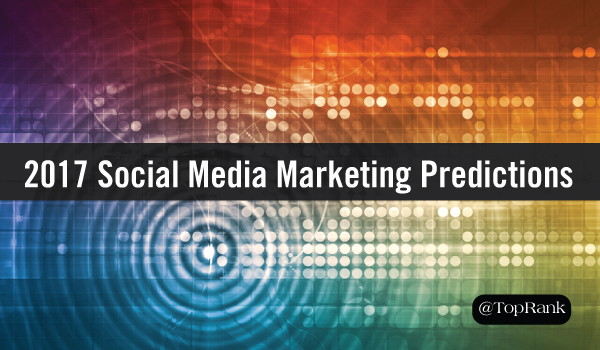 Ad targeting – Test different types of targeting within your social media advertising campaigns to find the best mix. Incorporate compelling imagery – Creating images that are unique, bright and energetic will go a long way. Rethink your CTA – If users aren’t signing up for demos or more information, consider offering a gated downloads. Experiencing General Digital Marketing Burnout? Read a book and explore new places – Stories give us new perspectives and a vacation can provide new scenery to provide new and fresh perspectives. Spark your personal life – Have a good diet, sleep 7-9 hours and exercise that makes you sweat. Mix up your work life – Network with other digital marketers to gain inspiration from by talking about what you do and try attending conferences to rev up your marketing know-how. Jumpstart creativity – Go to local theaters, art museums or concert halls to feel cultural. It can help in supplying you inspiration and motivation to keep creating. Want to Take Your Optimization Strategy Beyond Search Engines? Create a connection – SEO can deliver content-rich answers to buyers at the moment of need, and social media can provide the means to connect and engage. Be where customers are searching – While many marketers will debate what comes first, content, social media or SEO, the most practical approach is to use the tactics necessary for your target audience in order to “be the best answer” wherever customers are looking. SEO success – More than keywords and links, search engine optimization is an important part of the success equation when it comes to content marketing. Be conversational – While SEO has traditionally been able to drive online marketing performance on its own, search engine updates to address content quality and the more conversational nature of search behavior have combined with the growing popularity of social networks to change the SEO landscape forever. Think of SEO this way – If a customer-focused content marketing program is the sandwich, then SEO is the mayonnaise. It touches nearly everything and enhances the overall flavor of the sandwich. But on it’s own, not very appetizing. Email Marketing Campaigns Failing to Nurture Leads? Segment your list – Begin incorporating and requiring segmentation information in lead capture forms by adding simple qualifiers. Develop a lead nurturing strategy – It may be worth taking the time to develop a few user personas based on the data that you have. Proper persona development can help guide your strategy for different communication streams. Set lead nurturing goals – Understanding what exactly you want to accomplish can help drive your lead nurturing strategy and execution. Consider marketing automation – Marketing automation can simplify the lead nurturing process. However, it’s not a decision to be taken lightly. Marketing automation can be a large investment and requires the appropriate resources to execute effectively. This calendar year isn’t over until it’s over. Take the time that you have left and focus on the marketing activities that will help you have the biggest impact throughout the end of the year. If there are any additional quick tips or inspirations you’d like to share with our other readers, include them in the comments below! The post Curb End-of-Year Marketing Burnout with These Digital Marketing Quick Tips appeared first on Online Marketing Blog – TopRank®.